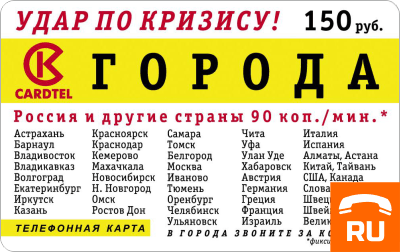 Calling Card Goroda (Cities) 150 rub. After the purchase you will receive the data contained on the ordinary telephone card of the "City" - a pin code (10 characters) and a card number (16 characters) indicating the validity period of the card. Information on tariffs can be found at http://www.cardtel.ru/cards/tarif.html?card=10. 1. Dial one of the access numbers. 2. In the tone dial mode, enter the pin code of your card, which is under the erasable cover. For an international call, dial: 810 [country code] [city / network code] [subscriber number]. To dial a number stored in the phone book, dial a two-digit number (from 01 to 99) and press #. After dialing the number, you will hear information about how many minutes and seconds you can speak in this direction. To make a call using an operator, call the support service number, tell the operator the pin code of the card and the phone number you want to contact. - dialing another number without re-entering the pin code after the end of the call (wait for an invitation for a few seconds without hanging up).